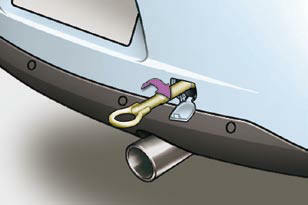 Procedure for having your vehicle towed or for towing another vehicle using a removable towing eye. 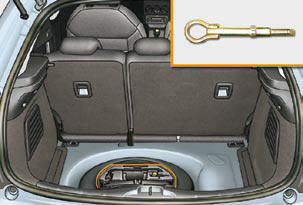 The towing eye is installed in the boot under the fl oor. 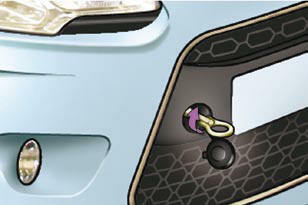 remove the towing eye from the holder. On the front bumper, unclip the cover by pressing at the bottom. Screw the towing eye in fully. Switch on the hazard warning lamps on the towed vehicle. Place the gear lever in neutral (position N for an automatic gearbox). Failure to observe this special condition could result in damage to certain braking components and the absence of braking assistance the next time the engine is started. On the rear bumper, unclip the cover by pressing at the bottom. When towing with all four wheels on the ground, always use a towing bar. When towing with only two wheels on the ground, always use professional lifting equipment. When towing with the engine off, there is no longer any assistance for braking or steering.